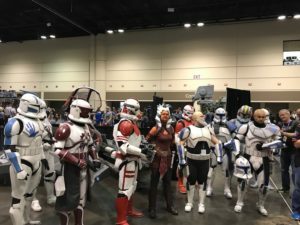 The first day of Star Wars Celebration in Orlando was electrifying from the moment the 40th anniversary panel began, to the show floor, to cosplay, Rogue One, and the show of droids. To start this is only the first day and more news and Star Wars awesomeness is to come Friday and Saturday when we get The Last Jedi panel, gaming, and a Rebels season 4 sneak peak. Today was special because it marked 40 years of Star Wars. While waiting in line it was easy to see how much love for Star Wars there is from the fans. In turn we got to hear how much those involved in Star Wars love their fans. 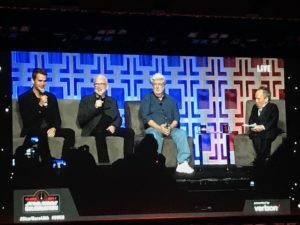 Our fandom is something truly special to span 40 years and we witnessed this in a perfect salute to Star Wars for fans around the globe and at Celebration. Just waiting in line people talked Star Wars, were costumed, and were some of the best people. Star Wars brings people together from all over the world, from all backgrounds, and it shows in the diversity of the fans. It is simply the most amazing experience as a Star Wars fan. Celebrating this year is better than ever because it marks the 40th anniversary of the theatrical release of Star Wars Episode IV: A New Hope. Because of this we were treated to the biggest of surprises. Beginning the festivities was Warwick Davis known to fans as the Ewok Wicket W. Warrick. 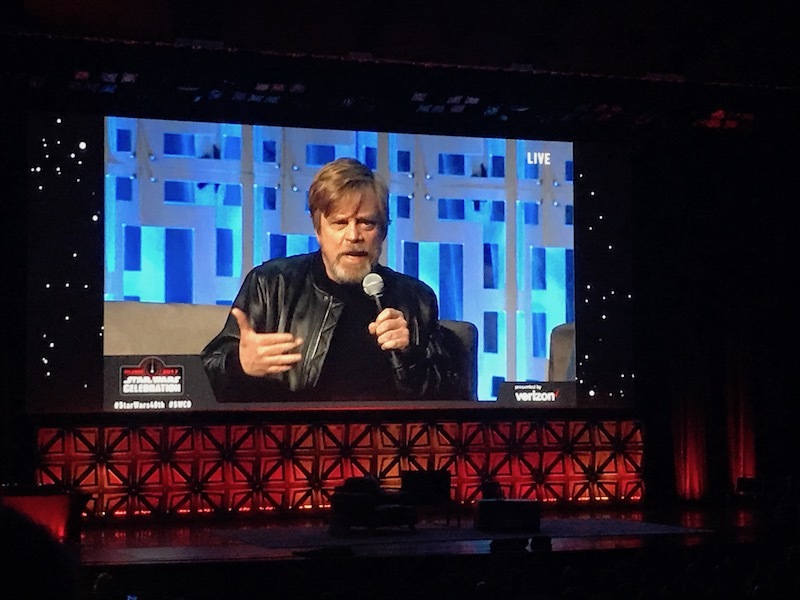 He got the crowd going by reliving his moments working on Star Wars and being a fan himself. All the guests are true fans of Star Wars as they repeatedly told us. Kathleen Kennedy, president of Lucasfilm, came on stage to tell the crowd about her journey with Star Wars. 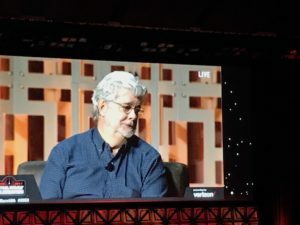 Then the greatest moment of any Star Wars fan was when the creator himself, George Lucas, came on stage. No matter where you were in the convention center it was the most amazing moment; the fans gave him an ovation for what he brought to our lives. We sat intently listening to his story of how he first came to the idea of a space opera that evolved from an idea for an action film. However, one thing that I took away from his discussion was why he really made Star Wars. It was for the kids. He admitted that the negatively doesn’t bother him because the kids love it. When they came to the set when filming Padme’s palace they would reach their hands through the gate and it is those moments for Lucas that tell him why he made these stories. He may have had the kids in mind but he shaped the lives of both young and old alike in ways not imagined in 1977. He also went on to talk about how Star Wars was something never before done in filmmaking and it terrified people. However, he got it done and pushed people to do these incredible things. 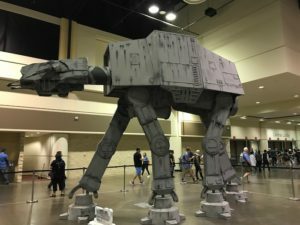 To do it he created Industrial Light and Magic (ILM) and they brought his creation from old fashion special effects, to digital, and then to animation. 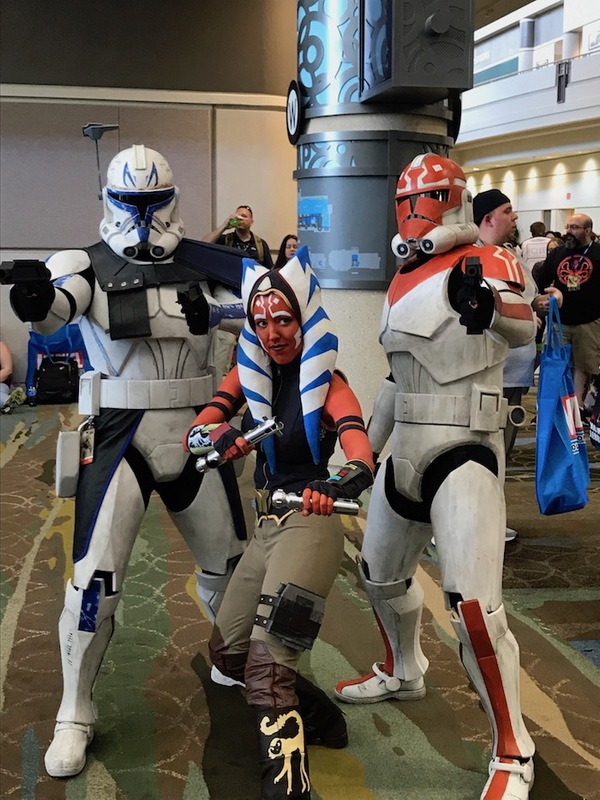 The animation was talked about as a conversation between Executive Producer for Star Wars Rebels Dave Filoni and George Lucas. Lucas talked about how the Clone Wars was created with feature quality with the lighting and animation. 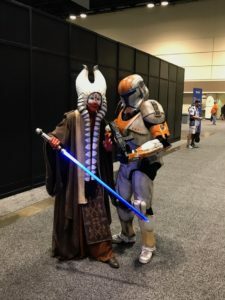 It also expanded the universe and created new characters like Ahsoka Tano. 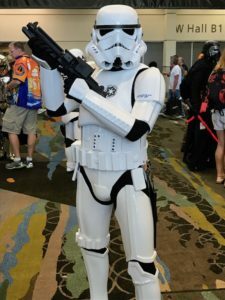 Another reason for the TV shows is to bring Star Wars to fans weekly and to connect fans. 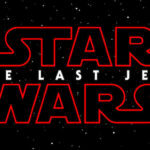 Some other special treats for fans were video messages from two well known Star Wars actors and actors in general, Liam Neeson and Samuel L. Jackson. Both said how much it meant to them to be apart of the movies but they also had a sense of humor about it. Liam joked with the audience about currently filming a movie where Jar Jar Binks goes to the darkside. Samuel L. Jackson wants Mace Windu to be brought back in other movies. Jedi have a way of returning with new limbs and stronger than ever, why can’t Mace? We need Mace Windu to come back and show the Sith who is boss. Next were the master and apprentice, Ian McDiarmid and Hayden Christensen. According to Ian out of all the evilish scenes going to the opera was the worst. It was the opera scene where he had an “evil chat” with Anakin Skywalker and he claims it was the longest dialogue scene of the movies. Hayden was privileged to work with Ian and learn from him. 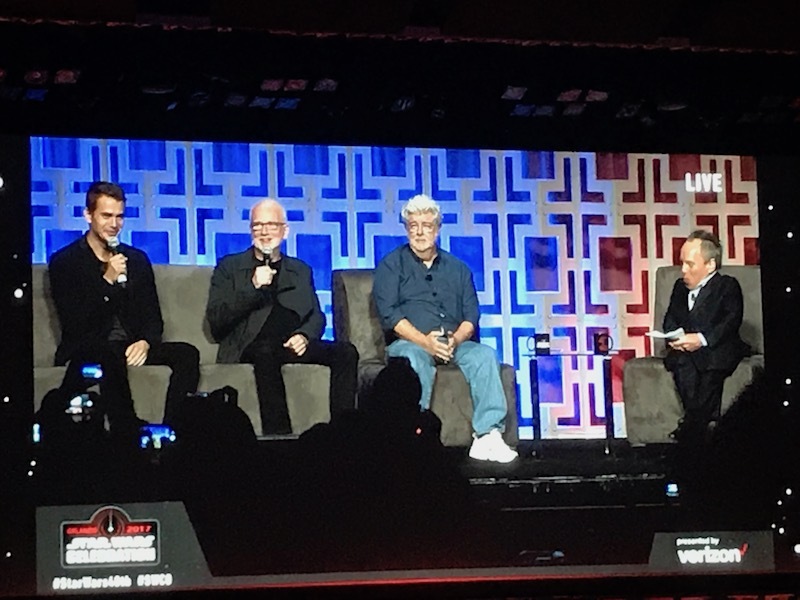 Both George and Hayden turned to Ian and gave complements about his real character, which according to them is the complete opposite of the Dark Lord of the Sith and the Chancellor. In Hayden’s discussion he talked about his epic lightsaber battle with Ewan McGreggor at the end of Revenge of the Sith and his stunt work. This was his favorite part and a childhood dream. However, he had one challenge and that was he wanted to make the lightsaber sound effects. George Lucas had to remind him it was all going to be done in post-production. Still one can’t help but make lightsaber noises with a lightsaber prop. We all do it. When he first met George Ian said he was thrilled but didn’t know he got the part of the Emperor or as he called it “The Emperor of the Universe”. We are glad he accepted because his performance in Return of the Jedi was perfectly sinister and true to the fashion of a darkside Emperor. Also because he is the Emperor it was only fitting George Lucas brought him back for the prequels. This time as both Sidious and Palpatine. Anthony Daniels, Peter Meyhew, and Billy Dee Williams joined George Lucas on stage for the original trilogy cast. They were then joined by Mark Hamill. When Anthony Daniels had his turn he and George discussed the making of C3-PO. The creating of the cast for the droid costume was not pleasant but it was the choosing of the droid head that was the main story. Lucas wanted a face that was neutral so the audience wasn’t aware of what he was thinking. The one we know was the one George chose but not the one Daniels liked at first. It was a good choice and C3-PO and Anthony Daniels went on to be in all eight films. Another tidbit of behind-the-scenes of Star Wars was how Anthony Daniels was unsure of his cues when talking to R2-D2. Only when George Lucas made a beep was when Daniels decided he didn’t need a cue anymore. 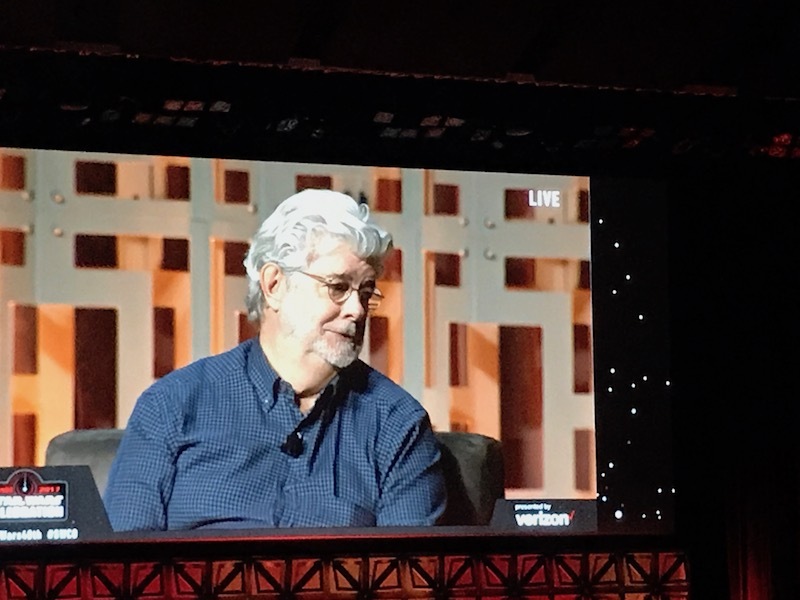 The funniest part was when he talked about going to Jabba’s Palace in Return of the Jedi and George came behind him making small R2 noises. Of course Anthony Daniels brought on his C3-PO voice to reenact the scene. Peter Mayhew just talked a little about how he and Chewbacca were alike height wise, but he was a character that was great to play. George Lucas told the audience how he got the idea for Chewbacca by seeing his Malamute, Indiana, riding around in the front seat. Then went on to say the Ewoks were originally suppose to be Wookiees, but when cutting them out of the final scene he kept one and made him the Co-Pilot of the Falcon. Billy Dee Williams was characteristic Billy Dee. He had a good time and liked everyone on camera and behind the scenes. He was a fan of THX-1138 before being called to Star Wars and when he got casted he created his character by avoiding anything stereotypical to bring Lando Calarissen to life. Mark Hamill was quintessential Mark Hamill and loved every minute being on that stage. He is so amazed by the fans and it is the fans that he loves most about being a part of Star Wars. According to him we are the most supportive people. George Lucas went on to say how he chose a cast that seemed like “old friends”. They could work with a chemistry that appeared to always have been there even if their characters just met. Mark Hamill then went on to relive his casting moment and the dialogue that has stuck with him to this day. It was a piece of dialogue that sounded like a random line about fear as a great defense and directed at a large-scale assault. 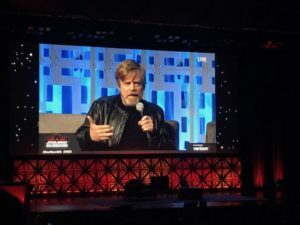 Hamill explained to the audience what it meant, which made some sense. It was said effortlessly and with emotion to sound like a real dialogue in the film though it never appeared in the film, but Mark Hamill did. 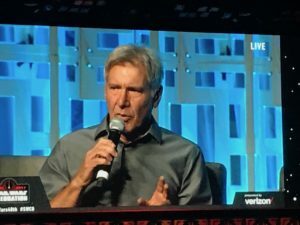 Another exciting moment, probably bigger than the appearance of George Lucas and where fans went crazy, was the appearance by none other than Han Solo himself, Harrison Ford. I still can’t believe Harrison came, it was kept such a secret and he never attended Celebration before. It was just an honor for him to come on stage and tell the fans his story. He started out in American Graffiti then went back to working carpentry. Then George came along with an offer that made Harrison Ford a star. Thank you George Lucas for casting a carpenter working to install a door for Francis Ford Coppola. They chatted about a new Science Fiction film and the rest is history. He then turned and thanked the fans in a moment no one would forget. Harrison Ford also told us that Star Wars is a story that has gone on for forty years and an actor needs a story to tell and this is what Star Wars provided. The final moments of the panel was a very moving and special tribute to Carrie Fisher. First a tribute given by Kathleen Kennedy and George Lucas but then a tribute by her daughter Billy Lourd. She told us how much Carrie loved her fans and how much Star Wars meant to her. Leia Organa was not just a Star Wars heroine but also a princess, a senator, a rebel, a general, and a leader. Carrie Fisher like Leia was a strong woman and it showed in everything she did. 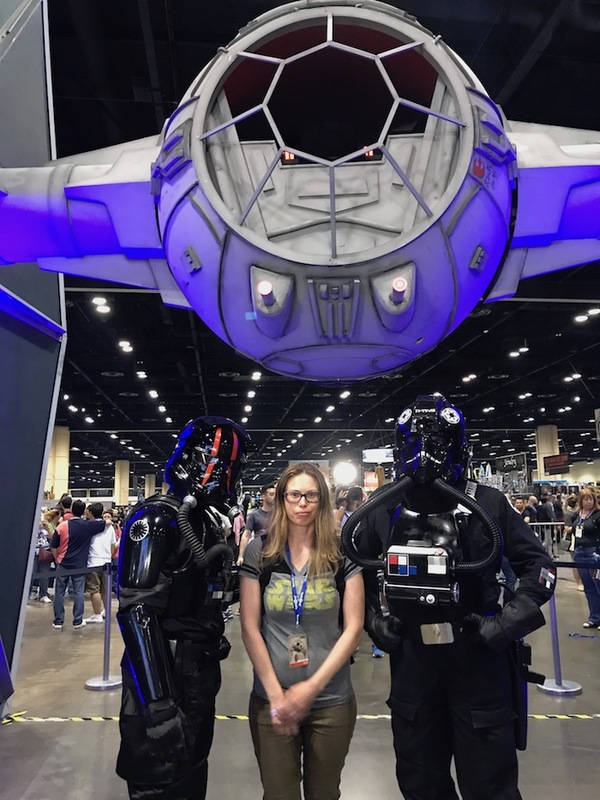 Her video collage and small moments put on screen for everyone around the world to see showed how much she has impacted our lives and the Star Wars universe. We will miss her. John Williams rounded out the tribute with Leia’s theme and then went on to give fans the iconic music of Star Wars, including the Star Wars theme and the Imperial March. Thank you George Lucas and all the cast for a great and memorable forty years and we look forward to another forty years of fantastic storytelling. 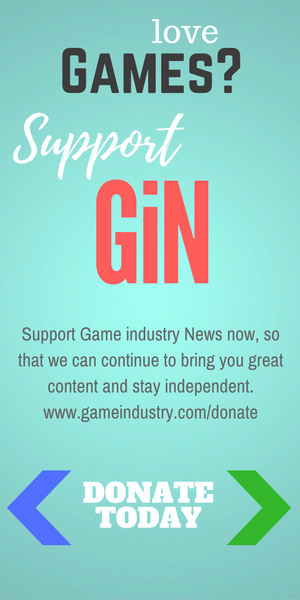 Our GiN Reporter, Marion Constante, with two TIE Pilots. 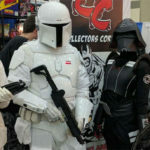 More will come on cosplay but day one had some great cosplayers walking around the convention center and show room. 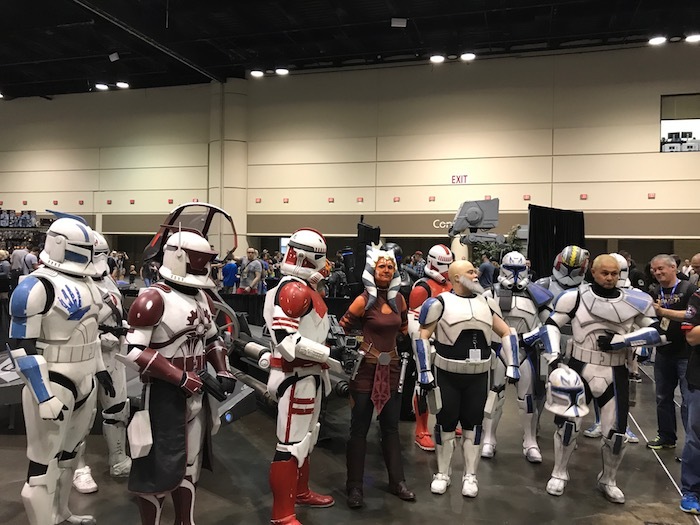 From the Stormtrooper, to Imperial Officer, Rebel pilots, the Rebels from Star Wars Rebels, Jedi, aliens, Clone Troopers, Darth Vader, Darth Revan, Director Krennics, Wookiees, Mandalorians, Ahsoka Tanos, and Kylo Rens Celebration had them all. Cosplayers also came both young and old and all are having a great time with some very unique costumes. This is what Star Wars is about the fans becoming their favorite characters and living the fandom. Besides Cosplay, the Celebration show floor also has customized vehicles and props including a TIE fighter, AT-AT, AT-ST, Jabba palace, and cars that were converted into Star Wars cars. 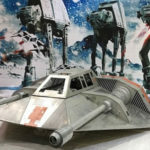 There was also a real working customized motorcycle from Vintage Works and a snowspeeder. However, it was the droids that stole the show today. 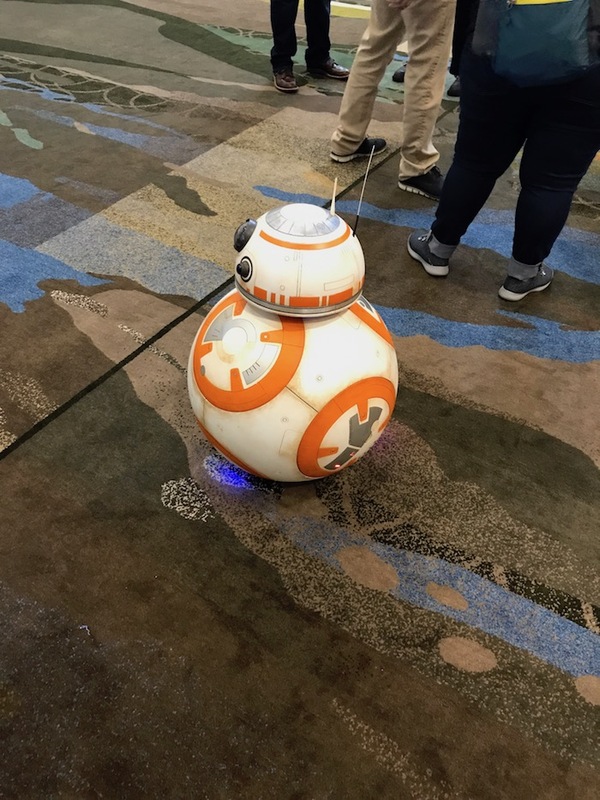 Thanks to the dedicated droid builders of the R2-D2 Builders club we got to see real astromech droids roaming around the floor. They are all radio controlled but look like they could have been in the films. Talking to some of the builders I learned that it could take years to build one depending on the amount of moving parts they have. 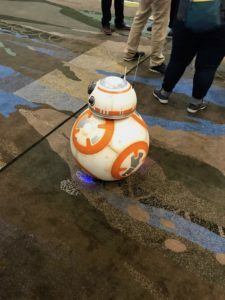 The BB-8 stood out because it rolled just like the movie BB-8 using magnetics. Even a steampunk astromech showed up. The creativity in these droids was amazing and I can’t wait to see more and learn more about how they build them in the days to come. Stay tuned for more droid excitement.